I have done a lot of counseling in my life. Many times I have wanted to share a story or two but never would do so for confidentiality reasons. Who wants to see their life displayed in a blog? A fellow pastor was given permission to share one young woman’s life long struggle with cutting. It reminded me of power that comes from just a single word of God. Listen to her story, then I will make a comment or two. The story comes from Dr. James Emery White. Just a few weeks ago, on a Thursday afternoon, a young woman came by the office to give me something. She was going to put it in the offering plate, but decided to just hand it to me. I was in a meeting, so she left it at the front desk. I opened the envelope, and inside a plastic bag were razor blades. And a letter she later told me I could share. “It says in the Bible, “Cast all your anxiety on him for He cares for you.” So I’m doing that today. This is an offering plate and I am offering to Jesus today more than any amount of money I could ever offer Him. These are all my razor blades that I have kept hidden around in different places out of my reach just in case. I am handing it over to God and I trust you also with this as well. Thank you for all you and this church have done in my life...” And then she signed her name. And now I am holding her razor blades in my hand, instead of her holding them in hers. And that is why I do what I do. This story is not unlike many I have counseled as well. 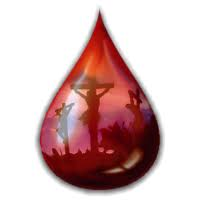 The blood of Jesus is for you and IT IS ENOUGH! Whether you are a cutter or not, the blood of Jesus covers every issue so you do not have to continue repeating the same destructive behavior. What a wonderful truth. Take time today to cast your cares upon Him and surrender yourself fully to His Lordship.